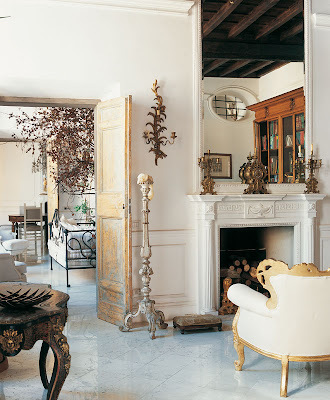 In a building that dates back to 1720, an apartment in Rome gets restored with a touch of Paris. 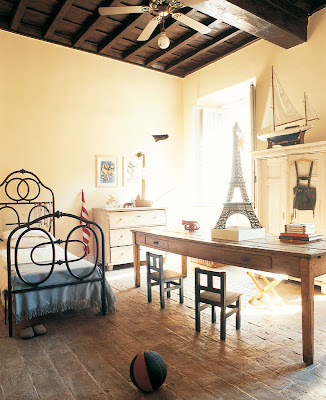 This home featured in Marie Claire Italia, is rich in old details and some classic French Furnishings. My Italian needs some brushing up, but from what I gathered, the owner of this home went to great lengths to find information detailing the original plans of the building. 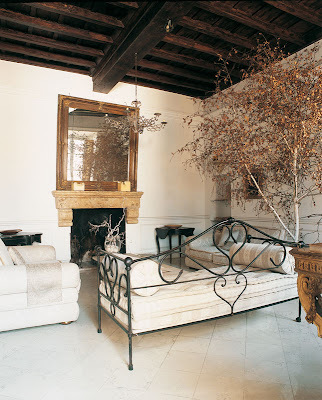 Located in Campo dei Fiori, the home was built by architects and engineers who worked at Saint Peter's. They left an incredible account of the homes structure. 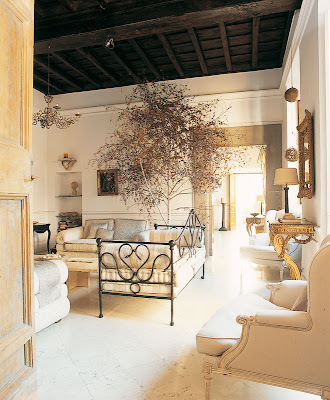 As a result, partitions were removed to uncover a series of rooms, original brick walls, wood beam ceiling's, 5 fireplaces, and doors in Windows made from the wood of pear trees. The wood was carefully stripped to it's original condition. 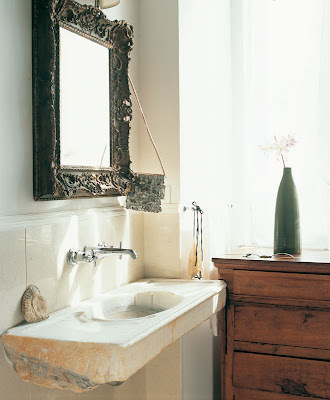 The homeowners embarked on incredible historic journey in the process of restoring what they now call home. The design choices in the restored home are superb. 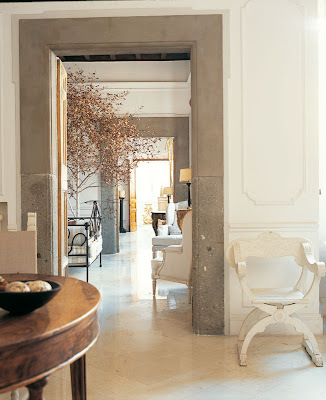 White marble flooring, creamy white walls and linen slipcovers make for a very bright and refreshing home. 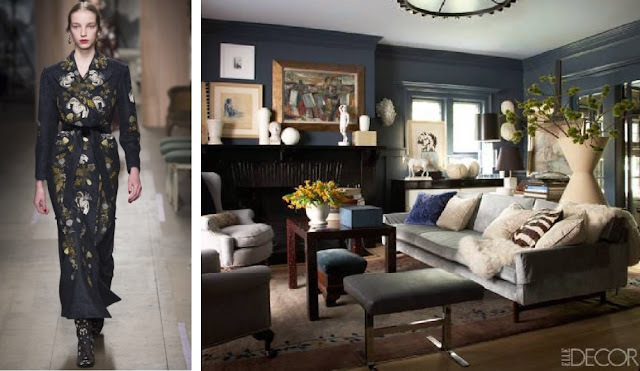 Classical pieces of furniture standout against the light backdrop, including a beautiful antique iron day bed, and a an updated Louis XVI chandelier and console. 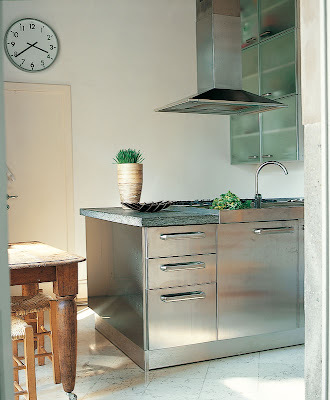 Of course, one would expect nothing less than a completely modernize.d kitchen from Italians, it's the one place there is no room for anything old. 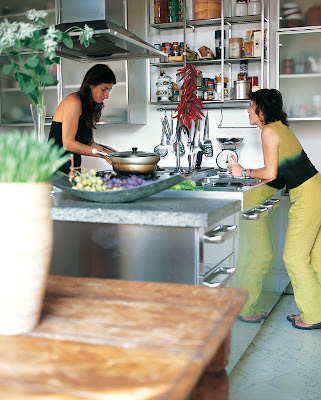 Some old wood furnishings were used to warm up the contemporary cooking space. 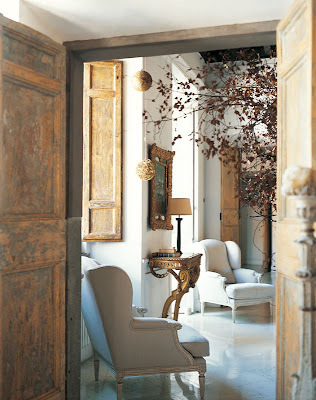 What a wonderful place to call home, surrounded by history and all the comforts of home. 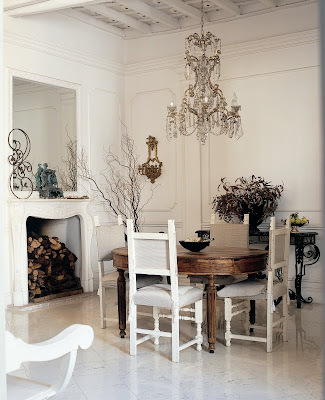 Thanks to Federica at Sweet as Candy for first posting on this incredible home.